To comply with ACA Accreditation Standards and state licensing regulations. Prerequisites: The minimum age for the Level I course is 15. 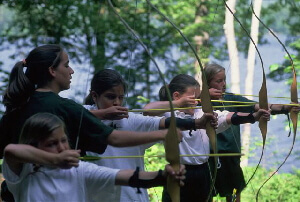 However, when conducting an archery class, those under the age of 18 are required to have an adult (18+) supervision. Certification: National Archery Association – Level I. Valid for three years from date of issue. Note: Full attendance and participation is required. There will be no evening class time for this course although coursework or homework will be assigned during this time. Please choose residential or commuter rate. We offer canoe instructor training through the American Canoe Association: Level 1 Introduction to Canoeing Instructor Certification Workshop (ICW, ICE). Participants can choose to include a one day Introduction to Canoeing to help review paddle strokes before the intensive Instructor Workshop. This is strongly encouraged by the instructor. Please note that all courses are physically demanding and occur in a fresh water lake. The temperatures in June can be extremely cold. We strongly recommend that you bring a wetsuit. Lifeguard Certification is highly recommended for anyone teaching children on the water. 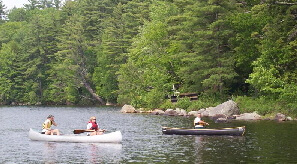 Refer to American Camp Association Accreditation Standards for appropriate water sport training requirements. To learn or review basic canoe strokes before moving into the instructor level course (includes Intro to Canoeing Skills Course on day 1.) This is strongly recommended for all students and especially for those with minimal paddling experience. Please note that the Canoe Instructor training is a full time commitment, including evening classes and coursework. Mike and his team at Adventure Mas are also available for building and inspections. Mike will also be at the exhibit hall at the ACA New England conference. Please contact us at [email protected] for details. Purpose: To be a trained waterfront lifeguard with rescue and first aid skills based on the American Red Cross Lifeguard Program (revised Feb 2017). Meets ACA Standards. Please note that the Lifeguarding training is a full time commitment, including evening class time and coursework. 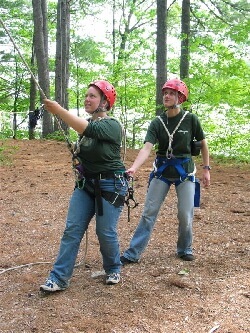 The course hours are designed as a classroom style residential training. We will begin at 9am on the first day of class. We will aim to be finished by 6pm on the final day of class but this will remain at the discretion of the instructors. Only participants who pass the practical pre-test will be allowed to continue the course. Swim 550 yards continuously demonstrating breath control and rhythmic breathing. You may swim using the front crawl, breaststroke or a combination of both but swimming on the back or side is not allowed. Swim goggles are allowed. Swim 5 yards, submerge and retrieve three dive rings placed 5 yards apart in 4 to 7 feet of water, resurface and swim another 5 yards to complete. Certification: American Red Cross Lifeguarding with Waterfront Module. Includes First Aid, CPR/AED for the Professional Rescuer. Certifications valid for 2 years. Comments: All aquatics courses are physically demanding and occur in a fresh water lake. The temperatures in June can be extremely cold. We strongly recommend that you bring a wetsuit. Purpose: The Review course is designed to review the Lifeguarding skills and core knowledge points required to recertify in Waterfront Lifeguarding. Includes CPR/AED for the Professional Rescuer and First Aid skills. Meets ACA Standards. Please note candidates in the review course are required to show current certification and are expected to arrive having reviewed the lifeguarding course manual and to be prepared for taking all written exams, participate in the water practice sessions and the in-water testing and final skills scenarios. Current Red Cross Lifeguarding with Waterfront Module/First Aid/CPR/AED certification. Note: If the Waterfront Lifeguarding/First Aid/CPR/AED certificate is expired, participants must take the full Lifeguarding Course. Candidates are expected to arrive having reviewed the lifeguarding course manual and to be prepared for taking all written exams and be prepared for practical testing and skills scenarios. Purpose: To train candidates in the American Red Cross Aquatics Program including teaching children and adults to swim, and giving water safety presentations to kids and their parents. 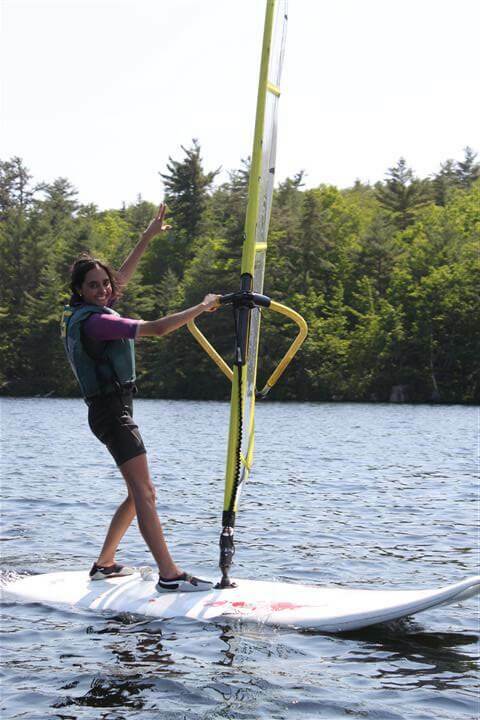 Refer to American Camp Association Accreditation Standards for appropriate water sport training requirements. Please note that the WSI training is a full-time commitment for the five day training. This includes morning, afternoon and evening classes and coursework. Students will need to have online access prior to arriving at the training to pre-register with the Red Cross. Some reading or course work may also be assigned in the few weeks prior to the training. We will aim to be finished by 6pm on the final day of class but this will remain at the discretion of the instructors. Only participants who pass the swimming pre-test (at the beginning of course) will be allowed to continue. Candidates must demonstrate proficiency in all strokes (minimum Level 4) and basic water rescue skills. Comments: Please note that all aquatics courses are physically demanding and occur in a fresh water lake. Expect to be in the lake multiple hours each day. The temperatures in June can be extremely cold. We require that you bring a wetsuit. Lifeguard Certification is highly recommended for anyone teaching children on the water.